It is hard to believe 2015 is in its final days. 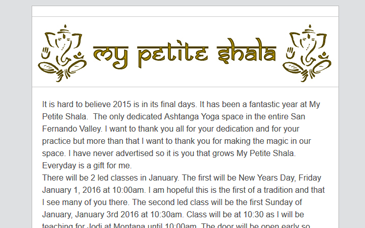 It has been a fantastic year at My Petite Shala. 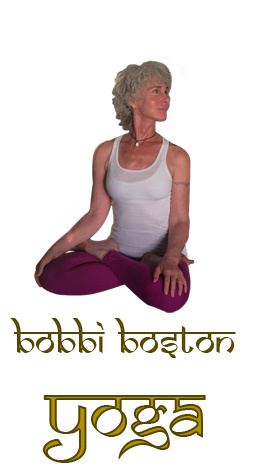 The only dedicated Ashtanga Yoga space in the entire San Fernando Valley. I want to thank you all for your dedication and for your practice but more than that I want to thank you for making the magic in our space. 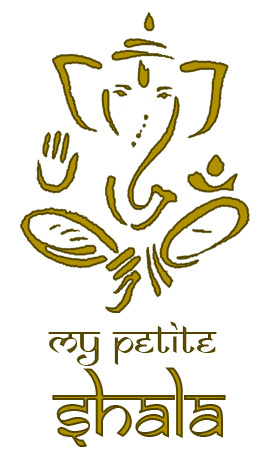 I have never advertised so it is you that grows My Petite Shala. Everyday is a gift for me. There will be 2 led classes in January. The first will be New Years Day, Friday January 1, 2016 at 10:00am. I am hopeful this is the first of a tradition and that I see many of you there. The second led class will be the first Sunday of January, January 3rd 2016 at 10:30am. Class will be at 10:30 as I will be teaching for Jodi at Montana until 10:00am. The door will be open early so please come, roll out your mat and we will begin shortly after 10:30. Perhaps you will make both! Remember, The Practice is the teacher and there is something to learn every time we step on the mat. Connection with the rhythm of the vinyasa and intense concentration are heightened in led classes. This significant present moment experience occurs as we are led through what is normally our self practice. Our January Moon Days both fall on Saturdays, the New Moon on January 9, the Full Moon on January 23. Although these are often not practice days, please keep in mind the effect the moon can have on our constitution and be sensitive around this time particularly. I wish everyone grace in this New Year, a moment of pause and space around everything from the most complex to the simplest decisions.